I’ve finished the first floor lamp for my dollhouse, here how it looks. I was planning it for a living room. The last week was very busy, I’ve made this floor lamp base, made several lace bookmarks/mats, I need to finish this Torchon book till the New Year Eve. Morris Chair – hard choice. I made the roses and leaves with polymer clay, every flower is attached to copper wire. To cover soldered spots I used acrylic paste. I totally forgot to show you the original chandeliers that inspired this work. Actually, I saw a lot of them in different antiques catalogs, usually French. But recently I found some Spanish chandeliers, also very beautiful. I also found that some were made with porcelain flowers, some with glass, some flowers were made of copper and brass. Also I saw all kinds of shapes and colors. Just perfect for me ! 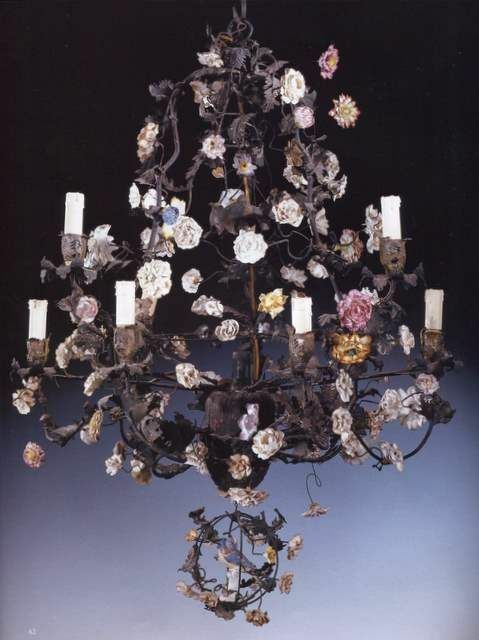 :) Usually I see such chandeliers called Louis XV-style. A bit too dark for me, to be honest, but lovely. My first choice was the pink one, but later I found that it was too dark for my LED lamp. So I took transparent one. And as I used LED light, you can see that it shines only in one direction. Not really good for a room. And about LED lamps, usually I don’t like them at all, most of them give this cold white light, that looks awful. I found some with warm white light, but they were a bit too big for using in miniature. So my husband suggested that we could buy LEDs with wave length= X-0.33. Y-0.36. Don’t ask me what it means 🙂 It’s all my husband ideas, he suggested that such LEDs were neutral white, not cold white. And I think he was right, the one in photos looks “warmer” to me than the ones I have. These LEDs are 5mm diameter. I liked the result – so I think I’ll keep on looking for small warm-white LEDs. I’m in the process of making flowers for chandelier, also need to make leaves too. I got the package from US Amazon today with two books – one on metal spinning (need more theoretical ground) and another one on Torchon lacemaking (yeah, I’m a lacemaking addict now). The metal spinning book is fantastic, it’s paperback though with black and white photos, but the contents are great with lots of useful tips and tricks. My husband loved it too, so he tried to make something out of brass. Look good to me! I really wanted to make some copper pieces, but since I don’t have needed thickness sheets, it will be all about brass, and possibly aluminum soon. Right now I don’t have clear ideas about what I could make, I need to check my antiques catalogs. With the help of my fellow bloggers, I did it! Brazing is much easier for me, after several hours of practice. I’m almost happy with this frame and plan to make couple more, just need to finish sketches. Here’s one of the epoxy roses that I made, not sure about using them though, maybe I should add more color, crystal clear look a bit plain to me. I should have put another title to this post, something like “Ugly Photos’ Post”, but nevermind. I had a strange week, I actually did a lot of things, but seems like I don’t have much to show to you. I’m still making the parts for my chandelier, another one. I also continue learning metal lathe things. My husband is a great teacher, very patient, I should say. I did learn a lot, but still have to ask him if I have any questions. As a result I made a beautiful candlestick, made of aluminum, but it looked very silver to me 🙂 Unfortunately, no photos for you here as it broke when I started cutting it off. The good thing is that I learned a lot, I also tried that mysterious jig for making spheres (absolutely, useless by the way for aluminum, because it’s easier to make them with files). I don’t have silver, but lots of copper. I’m not very good with spinning, I managed to make these, hm, “cups” after five or six attempts. It’s not my work, again:) It’s my hubby’s work. Recently we bought a jig for making spheres on metal lathe, and it was the first try. The height of this spinning top is 45mm and diameter is 35 mm. The jig is originally made for Proxxon lathes but it wasn’t compatible with lathe we have, so we had to build the fixture to mount the jig on lathe. The fixture was milled out of duralumin block. As for me, I’m still working on the balusters, I made six so far and need to make eight more. All of them are made of makore, I decided not to use beech, just didn’t feel right.